II: NewMoon Notes January 30, 2014 In these NewMoon Notes articles, I transfer the astrological information of the NewMoon onto the Tarot of the Holy Light Icon chart, so readers can see the emphasis that falls into your chart and your cards as the Moon makes her cycles. Some have asked me why the Tarot of the Holy Light shows the face of the Moon all through the deck. These NewMoon charts should help to certify why that would be. The Moon is Earth's guardian and support, curator of our atmosphere. She is said to collect up the influence of the Sun and all the other planets, rendering those different energies into a palatable baby-food for humanity, which is doled out in harmony with the waxing and waning of the lunar cycle. Every month we look in on the process at the moment of renewal, at the point when Sun and Moon co-occupy the same degree and minute. This puts our attention on opportunities for rebirth, renewal, reassertion of our ideals, and reawakening of our dormant qualities. 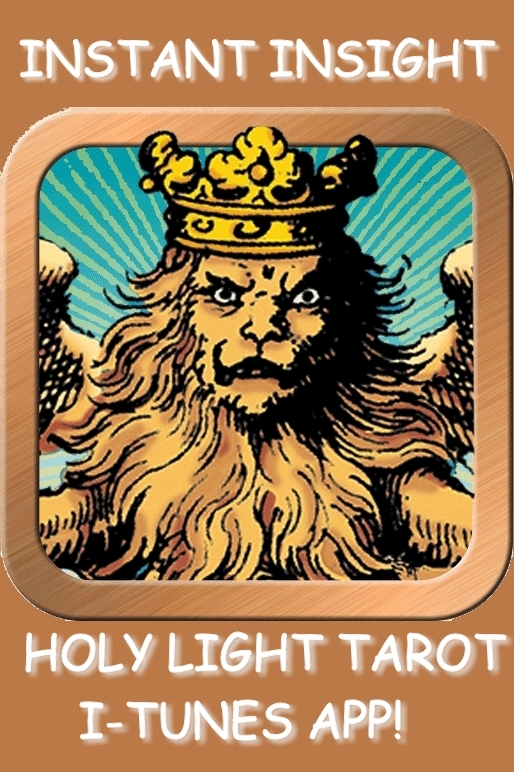 III Check out the HOLY LIGHT TAROT APP FOR I-TUNES ...use our Continental-Style Tarot App on your I-Phone for instant access to your own inner guidance, no matter where you are! https://itunes.apple.com/app/tarot-of-the-holy-light/id555363251?ls=1&mt=8. V. And finally, TAROT OF THE HOLY LIGHT T-SHIRTS, TOTE BAGS, POSTERS AND MUGS! Tarot University is proud to announce that you can now order a range of fine products emblazoned with the Trump images that inhabit the Tarot of the Holy Light. What could be more wonderful going into the holiday season, than giving your Tarot aficionado a wearable image of his or her favorite Trump from our luminous Tarot? The shirts are high quality, properly-fitting 100% cotton from Hanes, and the images are beautifully done, so you can be sure you will enjoy wearing them for years to come. You can also choose from among 12 Zodiacal designs created by another old friend, artist and inventor Fred Mueller, whose images of the Signs glow with gemlike intensity. There's something here to please every metaphysical taste! 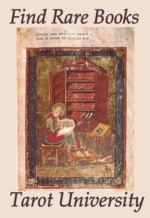 Our publication date and time corresponds to the New Moon each month. This month the Moon is conjunct the Sun on Thursday, January 30th 2014. As an astrologer-symbolist, I habitually tie my activities to the cycle of the Moon. If you would like, you can use the Tarot University ArkLetters to help you track the moon's phase - just subscribe to our website and you'll always know what the next phases and dates are! NewMoon at 10+ Aquarius on Thursday January 30 at 4:40 PM (EST) / 1:40 PM (PST). From this moment, the Moon begins to wax, or increase. 2nd Quarter, Waxing Half Moon at 17+ Taurus on Thursday February 6th, at 2:23 PM (EST) / 11:23 AM (PST). Full Moon at 26+ Leo on Friday, February 14th at 6:54 PM (EST) / 3:54 PM (PST). From this moment, the Moon begins to wane, or decrease. 4th Quarter, Waning Half Moon at 4 Scorpio on Thursday February 22nd at 12:16 PM (EST) / 9:16 AM (PST). Next NewMoon at 10+ Pisces on Saturday, March 1st, at 3:01 AM (EST) / 12:01 AM (PST). From this moment, the Moon begins to wax, or increase.